AMES, Iowa — Students learning to balance agricultural production with environmental impacts have a new resource developed by Iowa State University. 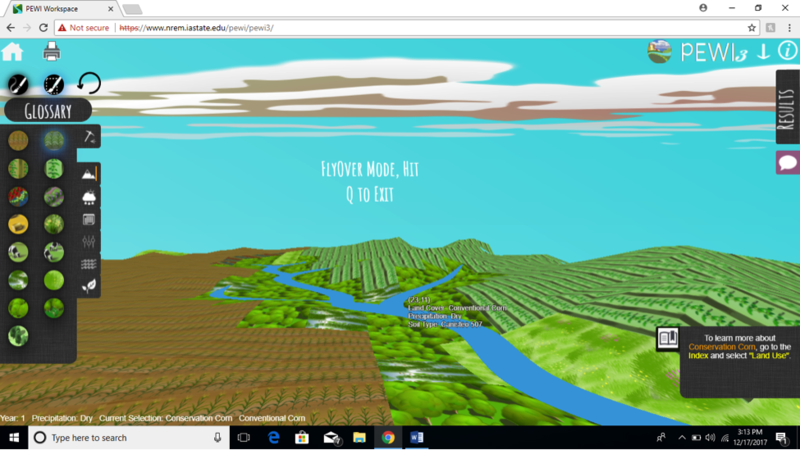 An online, educational game called People in Ecosystems Watershed Integration, also known as PEWI or pee wee, is in its third version at https://www.nrem.iastate.edu/pewi/. The latest version of the watershed-scale simulator or educational what-if game includes new features to make it more useful to students and instructors seeking to understand land use concepts. "With this new version, we're offering students a more holistic learning environment, and teachers a lot more options to tailor PEWI to meet their specific instructional goals," said Lisa Schulte-Moore, professor of natural resource ecology and management who leads the team that developed PEWI. This version, which is available at no charge, was designed to be more understandable and usable for those who aren’t experts. High school teachers and college instructors, who worked with previous versions of the game, requested a glossary of terms used in it, said Robert Valek, a graduate research assistant in natural resource ecology and management who has worked on developing the game. PEWI has a glossary of 100 terms, including images and videos, of such things as land-use types, features related to the physical environment, and management practices. Players are given a watershed of about 6,000 acres and choose from 15 land-use types, including growing corn or soybeans to pasture or installing wetlands, which they apply in 10 acres increments. Yield efficiency maps are another new feature to show players which parts of the watershed are most efficient at growing soybeans, for example. Physical feature maps that depict topography and other environmental patterns also are provided. While PEWI focuses on the U.S. Corn Belt, lessons can apply to agricultural regions globally, Schulte-Moore said. Teachers can customize PEWI for their students, turning on and off different land uses or customize information that appears when students hover over tiles. Up to six can play at a time, another new feature. Teachers can make the game competitive or a collaborative group assignment, another component teachers asked for, Valek said. The game works in all browsers, but is best in Firefox. Valek said it doesn’t require a high-end computer or high-speed internet connection. A screenshot of the game's new flyover view.